Its an adapter which adapts. No problems with sound though my only worry is how long will it last as I've already got it caught in my jeans pocket but this is more the fact you need to have a connector not so much the adapter itself! Good quality cable which gives good flexibility to use normal headphones. Recommended. The converter works well. My gripe is that it is not necessary. 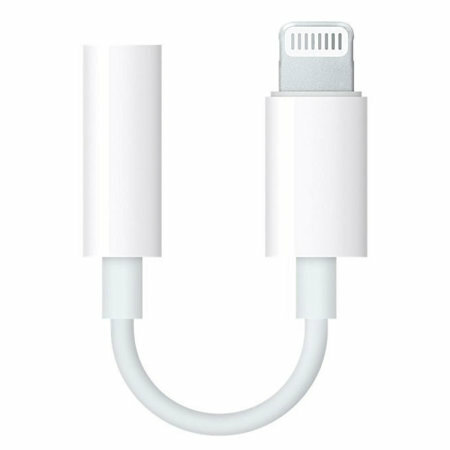 Apple was the first to do away with the headphone jack, making owners headphones obsolete instantly! I know a converter is supplied but they are prone to having the core cracking due to the moulding of the plastic, hence this replacement. Unfortunately other companies are following Apples route. I’m a bit of a sound geek so wanted to make sure my new iPhone Xr could be used with my stereo system; I’d moved from a 6 which had an aux port. It looks fine although a little flimsier than expected and while I haven’t cranked up the stereo, it seems okay. Annoying that I need one but it seems this is the only decent solution. Great product , genuine apple item 2nd one I’ve bought from mobile fun. Does what it says on the tin. Not cheap. But what apple product is? This is an Apple product so it works just fine. MobileFun's service was, as ever, spot on.